Again more amazing tips for would be writers. Oooh, love the photo. We need to use every available resource out there. I have used this resource before...and nothing beats using it at the library! Elizabeth, that's right, because there it is free! Sorry I wasn't online much yesterday. I was trying to finish a formatting job. Next time I go to the library I'm looking this up! That is a super resource and thanks to the libraries we don't have to buy a copy. That bridge shot is excellent. I have not used that resource, but I'm going to check out my local library and see if they have it. 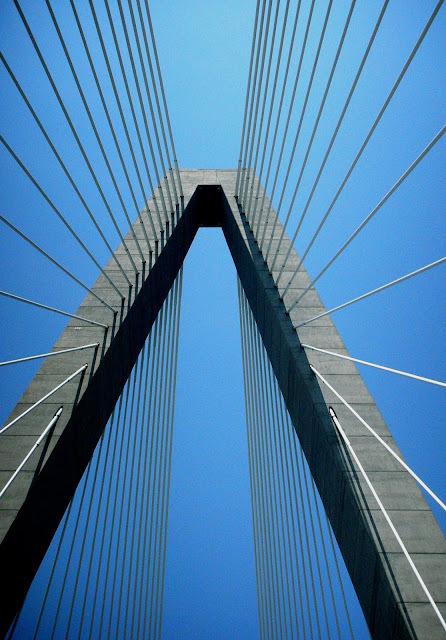 OOOh, your photo reminds me of one of mine of the Bucksport bridge. This is the actually bridge! I have used it. It gets a bit pricey to subscribe but the library is a great alternate resource. This is a great resource. So true that whatever you need, you'll find it there. I've never heard of this site, but now have it bookmarked for later use. Thanks for sharing and I've really liked all your tips this month....great stuff! Literary Marketplace is such a great resource AND it's almost always up to date which is hugely important given the way things change and shift so quickly in publishing. I hear lots of awesome things about the Literary Marketplace. I think I'll have to get myself a copy. Didn't even know about this place. Thanks for the link. Ella, I'll have to go look. Sia, it was shot out the sunroof of a very fast moving car. Johanna, they do shift quickly. Another good reason to visit my library! There are so many writer's resources. One I've used a lot is Writer's Market. This one sounds similar. Of course, with online publishing, things changed quite a bit, so I haven't purchased an actual copy of WM in a few years. Nor do I have an online subscription. So much of this info is available for free now. There are tons of resources out there. So many helpful folks in the writing community too. That picture is making me a bit dizzy! That sounds like an amazing resource! Thanks for the tip, Diane. Sounds like a wonderful resource and to be able to access in the library is awesome because it is a bit pricy for a yearly thing. Being British, it's the Writers & Artists Yearbook for me. I buy a copy once every two years. That is an expensive resource, but probably worth it! I've paid for it for a month or two when I was researching agents. It's a great resource. And your pic is fantastic! I haven't but I have heard it's good. I love that photo! Love the view... great angle! I've looked at it to familiarize myself with it but haven't yet used it. Thanks for sharing. Very helpful tip. and cool picture Under the bridge..
That's a heck of a photo Diane. Great resource. I'm passing the link to a few of my clients. Unfortunately my small local library doesn't keep it on hand. And I can't afford the subscription... Sigh. Something to look into next time I'm at the library. How were you able to take that photo?